My name is ARNY STIEBER. I live in Hyde Park. I�m a father, grandfather, a retired businessperson, a military veteran (Army, infantry, Viet Nam) and the President of the Chicago chapter of Veterans For Peace. 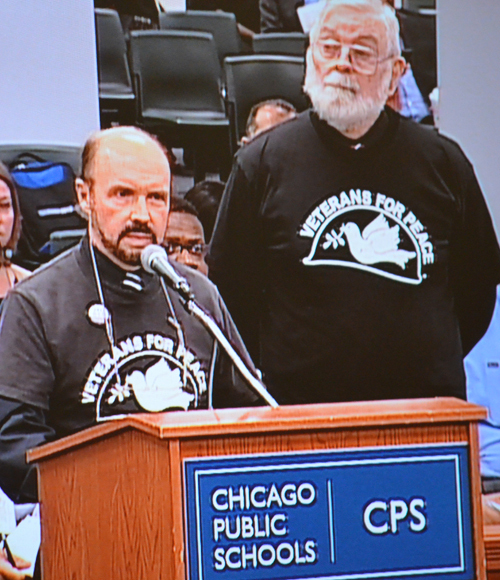 Arny Stieber of Veterans for Peace asked the Chicago Board of Education to "demilitarize" itself during remarks to the September 25, 2013 meeting of the Board. Substance photo by George N. Schmidt.As I stood on the street watching the Memorial Day parade, I was struck by the legions of young, mostly black males marching behind their JROTC banners. There were hundreds, maybe a thousand. I suspect they weren�t from the north side. They were being taught that they can get recognition by being �in the military�. The crowds cheered, the flags waved, proud parents stood and watched. What most didn�t see was the long run result. The children were being taught that the military solution to conflict � that is, death and destruction - is the �American way�. We don�t �send in the Marines� to have dialogue. We don�t drop bombs, shoot rockets and invade countries to learn about their needs. The U.S. has a culture of violence and much of it stems from our promotion of the military and it�s joined at the head partner - violence. CPS is the most militarized school system in the country. The myth is that the military teaches discipline. The reality is that the military teaches people to be pawns � to follow orders without question, to do as you are told.